This mod is for the NEO GEO CD top-loading unit. This mod allows you to switch your unit from either NTSC or PAL to the other. We're still waiting for confirmation on the one area on the bottom of the NEO CD board, but for now this is what we have. This is a relatively easy mod. There are only a few things to adjust. As is usual (For SNK at least) everything needed is clearly labelled on the board. The following pic shows a spot on the video board, which is easily accessed by simply opening the NEO CD and removing the video board. This is a picture of an NTSC unit. You can see there are two sections: One listing two resistors (20k & 16k) and the other saying only H/L. To switch this unit to PAL, simply replace the existing resistor (R47) with a 20k ohm resistor. For the other, remove R52 and add a jumper connecting the two holes labelled JN1. 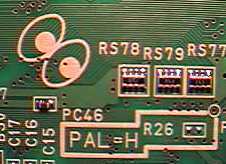 If you're converting the unit to NTSC, replace the 16k R47 with a 20k, then remove the jumper and insert a resistor like you see above. This is another picture of an NTSC unit. If you only change the above jumpers, you will end up with a 60Hz PAL signal. 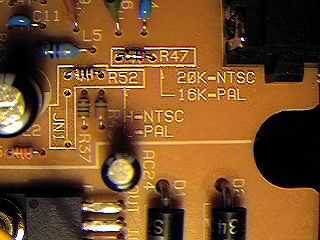 This jumper (On the bottom of the main board) sets the frame-rate to either 50 or 60 Hz. To enable 50Hz, simply connect the two points labelled R26. For 60Hz, remove the jumper. Thanks to Christian Metzler for this information.